This is the fourth and final article in my short series of reviews on my personal genomics test with 23andMe. I wrote last week about my disease risks, carrier status and drug responses, and traits. I'm now going to look at the ancestry part of the service, which as a family historian, was my primary motivation for taking the test. 23andMe provides three different types of ancestry information. For deep ancestry purposes you are given a haplogroup assignment for your mitochondrial DNA and, if you are male, for your Y-chromosome. An Ancestry Painting gives you broad details of your ethnic percentages - African, European and Asian. Finally, the Relative Finder service identifies your close cousins in the 23andMe database and allows you to make contact with them. I have already had a full mitochondrial sequence (FMS) test at Family Tree DNA and this aspect of the 23andMe test was therefore somewhat redundant for me, but I was nevertheless interested to see how the two results would compare. The FTDNA FMS test looks at all 16,569 base pairs in the mitochondrial genome whereas 23andMe test just 3,000 SNPs. I wrote previously about my unique mtDNA results and my rare U4 haplogroup. When I received my FMS results earlier this year FTDNA refined my haplogroup to U4c1. I have the advantage that I am the co-administrator of the mtDNA haplogroup U4 project at FTDNA. Within the U4 project we have a large body of FMS results and, using these results in conjunction with published sequences on Phylotree and GenBank, my co-admin, Ron Scott, has been able to refine the haplogroups for many of our project members, including me. Within the U4 project I am now classified as a U4c1a1b. 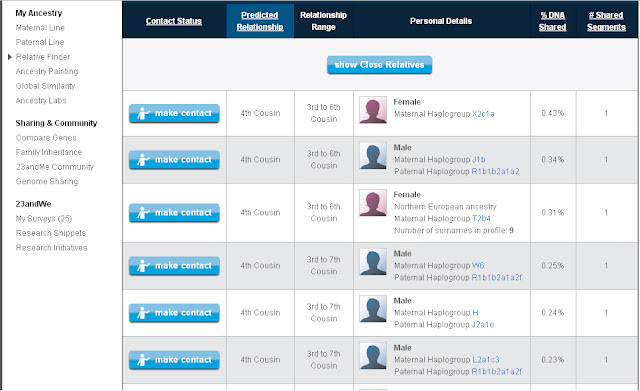 23andMe have also placed me in haplogroup U4. They have however allocated me to a different subclade - U4a2b. I'm not yet certain of the reasons for the discrepancy, but suspect that 23andMe have not tested enough SNPs to provide an accurate haplogroup assignment. This is a very new science, and the haplogroup nomenclature is in a constant state of revision so it is understandable that in the early days there will be discrepancies. Haplogroup prediction is also particularly difficult for rare subclades like U4c. For all practical purposes at this stage knowing the subclade does not tell me very much as so little is known about haplogroup U4. As a bonus, 23andMe do however provide some very interesting background information on haplogroup U4, whereas FTDNA provided hardly anything at all and we have had to work hard instead to build up a list of resources on the U4 project website. I already know from my family history research that all my lines going back at least to the 1800s, and in some cases for many hundreds of years previously, are from the UK. It was therefore no surprise that my Ancestry Painting showed that I am 100% European. This feature is probably of more interest to people of mixed ancestry where, for example, Aboriginal or Native American ancestry will show up as "Asian". A new feature, Ancestry Finder, has been introduced in the last few weeks which will tell you which countries your ancestors might have lived in. As I already know that all my ancestors are from the UK this feature again did not really tell me very much. I was however somewhat surprised when I lowered the threshold to five centiMorgans (a measure of matching DNA segments) to see that I matched people with four grandparents from Romania, Switzerland, Spain, the Netherlands and Sweden, with just 0.3% of my genome from the UK. 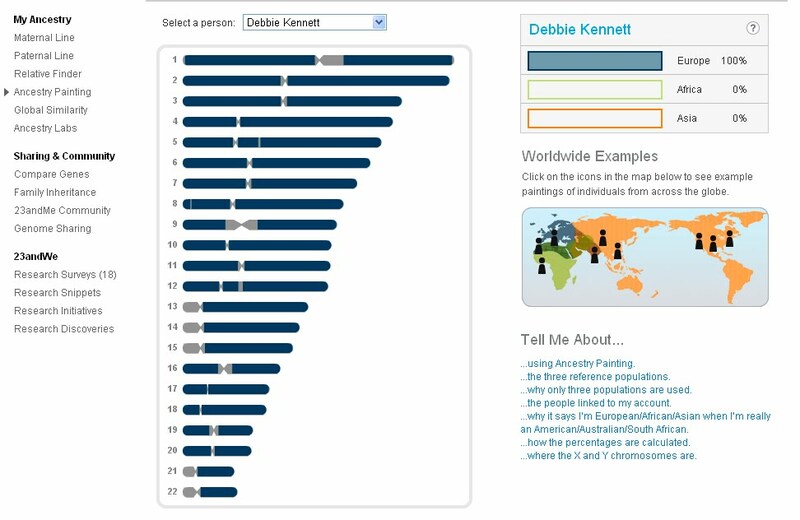 This result is probably more of a reflection of the lack of UK testees in the 23andMe database. It is also possible that some of the participants have provided incorrect information on their ancestry (the country information is taken from a customer survey). Relative Finder is an opt-in feature of the 23andMe service. It works by detecting shared segments of autosomal DNA and predicting the relationship based on the number and size of the shared segments. I currently have 151 matches in the Relative Finder database. Twelve of these matches are predicted to be fourth cousins, and the remainder are predicted to be fifth cousins or distant cousins. For each prediction a relationship range is given. Some of my fifth cousins could be third to sixth cousins; others could be third to tenth cousins. The names and contact details of your matches are not made available to you. You are instead given information on their haplogroups, and, if they have filled in the information on their profile, their country of residence and number of surnames listed. You can contact your matches but are restricted to contacting just five people per day. Over the last few weeks I have religiously contacted all 151 of my matches, but have been very disappointed that so far only 14 people have accepted contact, a mere 9% response rate. Much to my surprise two people have actually declined contact, which was somewhat unexpected for what is meant to be an opt-in service. Of the 14 people who responded 13 are in the United States and just one is in the UK. Although I've exchanged details with all of these people we've not been able to find our common ancestor. American research is particularly challenging and American researchers are rarely able to trace their lines to a specific location in the UK. Without a surname in common there is, therefore, little hope of finding the link in the paper trail. My sole UK match had taken advantage of the special offer for Parkinson's disease patients, and had only just started to research her family history. All in all the ancestry part of the 23andMe service has not been particularly informative. I am pleased that I was able to purchase the Complete Edition as, much to my surprise, I've found it far more rewarding than I expected exploring my health and traits with 23andMe than my ancestry. Relative Finder is however still very new and it is quite possible that I will have more responses and more meaningful matches in the future as the database grows. 23andMe currently have in excess of 50,000 people in their database. The company does not however disclose how many people have opted to use the Relative Finder feature. Other genetic genealogists have reported a similar problem with a lack of response to Relative Finder requests with response rates ranging from about 10% to 30%. From a British perspective another problem with the Relative Finder test is that the vast majority of the 23andMe customer base, probably well in excess of 90%, is in America. While it is interesting to know that I have lots of distant genetic cousins in America it is not going to help my family history research if there is no way of finding the connection in the paper trail. For ancestry testing the Family Finder test from Family Tree DNA is likely to be a much better option. FTDNA have a very large customer base who are primarily interested in genealogy. In contrast, it would appear that the majority of 23andMe customers have tested primarily for health reasons and have little interest in, or knowledge of, their family history. In addition, Family Tree DNA, thanks to their partnership with the Genographic Project and their sponsorship of Who do you think you are? Live, have a much more international customer base and, more importantly from my point of view, more customers in the UK. I've already had Family Finder tests done on both my mum and dad, and I wrote previously about my dad's Family Finder test. My mum's results have just come in and I will write more about this test in future posts. Autosomal DNA testing for ancestry purposes is still in its infancy. Whether you test with 23andMe or Family Tree DNA such a test should be considered as more of a long term investment. In the short term the test is best used to prove or disprove a particular hypothesis, such as whether or not two people share a common great-grandparent. The cost of the test is still a formidable barrier, especially for those of us in the UK where the weak pound makes the tests comparatively more expensive. However, as the cost of the tests come down and the databases grow in size, autosomal DNA testing will become an increasingly useful tool for family history research. - The cost of autosomal DNA testing tumbled in 2013 and the three providers now charge just $99 for the test. There are significant differences in the features offered, the international availability and the shipping costs. For an up-to-date comparison see the ISOGG autosomal DNA testing comparison chart. - 23andMe updated their ethnicity predictions in December 2012. See my post on 23andMe's new Ancestry Composition - a British perspective for a review. I hope your acceptance rate will increase. A couple of months ago, I finished sending out all my invitations, and I still have acceptances trickling in once in a while. My overall acceptance rate is about 25%, but it took a while to get there. Do you have any surnames in your profile or anything? I think that helps motivate people to respond. Have you had a chance to check out the "public match" section of Ancestry Finder much at all? It just came out last Thursday. In the Ancestry Finder lab, you can check the "only show public matches" box. This is helpful because the cut-off for Relative Finder is 7cMs, but the cut-off for Ancestry Finder is 5cMs. So you may be able to find new cousins from Ancestry Finder that are slightly below the threshold for Relative Finder. I found about 20 new cousins from Ancestry Finder, and they seem to be more interested in genealogy & communicating with me than most others in Relative Finder. Relative Finder, by the way, is opt-out, not opt-in. This may partially explain the low response rate. I think a lot of people are only interested in the health aspects, and they check their results when they first come in, and then it seems they don't come back too often. I think the timing of my Relative Finder contacts was somewhat unfortunate as a lot of people will probably be away on holiday. I do hope I get more responses in the coming months. I have put a long list of surnames in my profile and I've also added a separate list of all the locations. I've looked at the Ancestry Finder matches. I have very few matches with people with public profiles. The ones I do have mostly have four grandparents in the US. One person has four grandparents in Germany, and another four grandparents in Spain so there's little chance of finding an ancestor in common. However on checking this morning I was very pleased to see a new match who has four grandparents in Australia and for the first time a surname that I recognise so I've just sent him a message. Are you sure Relative Finder is opt-out rather than opt-in? I thought I had to tick a box to use the service. In the settings under Relative Finder options it does say: "By checking this box, your profile will not be able to use Relative Finder to view or contact relatives. Also, you will not show up in other people's Relative Finder results. If you change your mind, you may re-join at any time by unchecking the box." Hi Debbie this is NickGC from RC. I know your post is over a year old, but I hope you still read comments. I too showed 100% European on 23andMe and this jibed well with my quite detailed ancestry of colonial Americans on my paternal side, and mostly Scots and a few English ancestors on maternal. Back to 1600s to late 1700s for paternal lines, and 1750s to 1800 for most maternal. Have you tried sending your raw data to places like GEDMatch, or running it through the Dodecad calculators and others that are freely available. Since they apparently use different mixes of populations for comparisons the results can be quite eye opening. Doug McDonald, a University professor, is also a person who will run your results through his computer. What I found is that 94.5 percent of my ancestry is indeed as the genealogy show, but about 5.5% is very likely to have come from a (possibly ancient) Roma/Gypsy contribution. If you haven't tried these calculators, etc. I suggest you do... great fun! I haven't bothered with all the other services that provide ethnic percentages. I already know where all my ancestors come from so they are not going to tell me very much as there are not yet enough reference populations in the databases to provide meaningful results for people of 100% British ancestry. I'm waiting for the People of the British Isles Project to publish their research as they have been able to find differences between people in different regions and sometimes counties of the British Isles. I'm looking forward to the day when I will be able to find out what percentage of my DNA is from Devon! I'm not aware of any sequencing that has been done on gypsy populations. Where did this information come from? Hi - you don't have to have a population of Romani/Gypsy to draw conclusions, which would be a self-identified population under the best of circumstances. Since the Roma derive from populations who migrated from India - perhaps very specific tribal populations - you compare markers to the fairly wide-ranging DNA studies of Indians. If a person in Norway has an mtDNA haplogroup, or a YDNA haplogroup, or a series of specific SNPs that occur with great frequency in these Indian populations, you can make some pretty robust inferences. There is a Romany DNA project. Lots of Romany men come out as haplogroup H, but equally there are many R1b1a2s. If you have a gypsy surname and are haplogroup H then the results would be consistent. A small Indian admixture percentage could mean anything, especially with the small reference population databases, and would not necessarily indicate gypsy ancestry. The Roots of the British project is doing a special study of British Romanies but I believe they're only doing Y-DNA and mtDNA testing. Just got my mitDNA results from 23andMe today.....looks like U4c1 too. Shows me as 100% European (breaking down roughly to 80% English, 12% French/German, 2.3% S European, and a percent or two E European and Scandinavian). The paternal halpotype is Rm405. 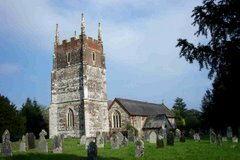 Thru Ancestry.com, I can trace the maternal line directly back to the 1200s in York and Kent----my 13th Great Grandfather was Sir Thomas Wyatt The Poet, alleged lover of Ann Boleyn and a member of Henry VII's court. My paternal side vanishes around 1680 in the Cologne region of France/Germany when the first generation came to America and settled in Virginia and then Pennsylvania. All of this came as a bit of a surprise as the family legend had a lot of Native American stories, and I have very dark copper colored skin, black hair, and brown eyes.....along with shovel shaped incisors and most of the other Native traits you'd expect. Best guess is an ultimate Central Asian/Siberian heritage, with mine heading to N Europe and the other kin heading for the Siberian land bridge into N America during the last ice age???? Any rate, both the DNA and Ancestry results were a bit of a surprise, to say the least. English nobility direct lineage, first generation in Jamestown Colony, and now an oddball U4 mit DNA. Any ideas on any of this out there? (I have no living relatives to compare to; am an only child of two only children, and only have a very recently discovered half-cousin related by an unknown half-sister of my mother's which my grandfather sired and abandoned back around 1916 which nobody knew of until I unearthed the info a few months back). It is therefore quite possible to have a distant Native American genealogical ancestor who has not left any genetic legacy in your DNA.